– NEW Online Gift Shop, featuring products such as our trail map, hats, hiking stick medallions, bandanas, and more! 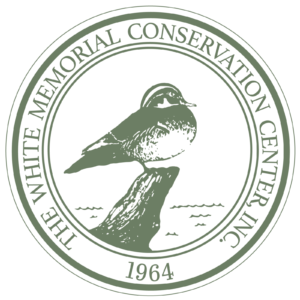 – The White Memorial Conservation Center Gift Shop, featuring a broad selection of items for children and adults. You’ll always find a wide assortment of field and audio guides, Dover Books, stuffed plush animals, educational toys, posters, puzzles, and games. Our “Connecticut Corner” is stocked with a variety of unique Connecticut made-crafts. Choose from fragrant goat milk soaps and creams, maple syrup, one-of-a-kind jewelry pieces, books, and DVDs by local writers and naturalists. We also have many gifts for kids with prices starting at just $.10: figurines, stones, keepsakes, and more. Our inventory changes frequently. For an extra special gift, order a hand-decorated, custom-designed walking stick made from White Memorial saplings. The Conservation Center Gift Shop is located within the Nature Museum, found on the “Main Area” of our property.